Finance Minister Thomas Issac will launch the 120-passenger capacity SWTD boat in a function to be held in Vaikom at 2 pm on October 4. Kochi: ‘Vega 120’, the state’s fastest inland ferry with a maximum speed of 26 kmph, will be deployed in the 35-km Vaikom-Ernakulam section from Sunday. Finance Minister Thomas Issac will launch the 120-passenger capacity SWTD boat in a function to be held in Vaikom at 2 pm on October 4. “Daily the boat will start from Vaikom at 7.30 am to reach Ernakulam boat jetty by 9.30 am. It will have stoppages at Perum-balam South, Panavally and Tevara Ferry. The return trip will start from Ernakulam Jetty at 5.30 pm to reach Vaikom by 7.30 pm. 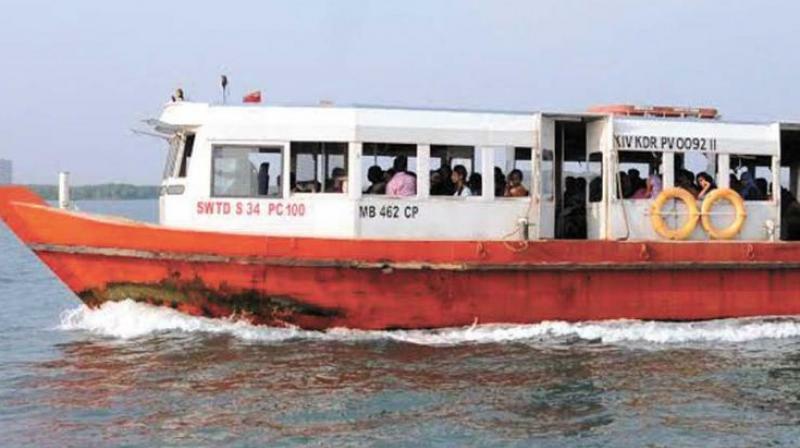 In between, the boat will conduct services to Fort Kochi,” said Shaji V. Nair, SWTD Director. Out of 120, 40 seats will be in the special air-conditioned cabin in front portion. The normal ticket charge will be Rs 40 for travel in the entire section while that in the ac cabin will be Rs 80. The 25-meter catamaran ferry was built by Kochi-based Navgathi Marine Design & Constructions. “The boat enjoys many features such as optimum performance with high acceleration and stopping capacities, 40 per cent lower fuel consumption and active fire protection equipment among others,” said Sandith Thand-assery, CEO.